So what do you immediately think of when I say ‘road rage’? Is it screaming at another driver for cutting you off, beeping your horn at the car in front for being too slow, or sticking the V up at someone for not letting you pull out? According to one man in Sacramento, California, it’s none of the above. Instead, after ramming his car into another vehicle, he then decided to get out and stamp on the roof of the car. 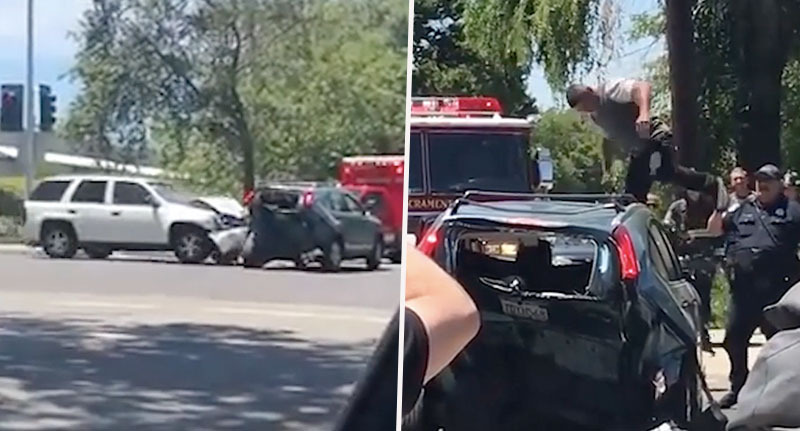 The person filming captures the terrifying moment the white Chevrolet Blazer smashes straight into the black Honda in the middle of the street on June 4. Instead of getting out of his vehicle and exchanging insurance details with the owner of the Honda, the driver decides to put his foot on the accelerator until the tyres spin and a stream of smoke escapes from the vehicle. 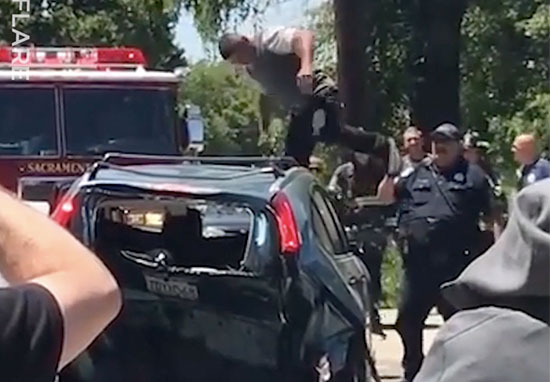 The man can then be seen climbing out of the Chevrolet through his driver’s window, before walking onto the roof of the Honda. Luckily, no one was in the Honda at the time because the man then proceeds to stamp aggressively on the roof of the car. He does so with such force that he smashes the front windscreen completely. Still, he continues to jump on the car causing even more damage. Sirens can then be heard and a police officer approaches the man, cocking a shotgun whilst doing so. This does nothing to deter him though, as he continues to kick and stamp on the car. Officers then surround the entire car, at which point you’d expect the man to snap out of his road rage and climb down. However, he has one last fight in him as he kicks at the wing mirror and breaks it. Alas, this was his downfall as he ended up falling off the car whilst doing so and the police immediately apprehended him. To get out of the car after hitting the Honda and to stomp on it shows you how much rage he had. It was pretty crazy. It appeared he rammed it four-plus times – there where car parts all the way down the street leading up to the intersection. I suspect the driver of the Honda bailed out at some point. While it is not clear exactly why the man became so enraged and decided to destroy the Honda, I cannot begin to imagine what would have justified such behaviour. And it appears he isn’t the only driver to react in such a violent way when road rage strikes. Although he doesn’t go so far as to completely destroy the car, it isn’t for lack of trying as he does attempt to pick the car up and tries to break the windscreen wiper. It doesn’t end well for him though when the car speeds off and momentarily takes him with it, as he somehow ends up on the bonnet. I think the moral of the story here is not to take on a car, no matter how angry you are in those moments of road rage, because karma will come back round and bite you.